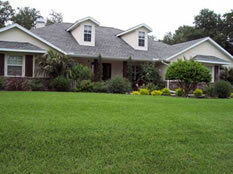 C raig’s Perfect Turf Landscaping Inc. also concentrates largely on sod installation. We can install a whole lawn or do a partial lawn replacement. The most common reason for a lawn replacement is infestation of chinch bugs, grubs, crab grass, Bermuda grass, or a drought. An irrigation check is performed before starting any sod removal to make sure proper coverage is there and for relocating sprinkler heads. We then check for phone and cable lines. Certain weeds need to be killed off completely before removing the sod to ensure the root is dead. Proper prep work is the key for new sod to do it’s very best. We remove the old sod, smooth out ground, re level any dips or holes and shovel edges along any pavement, borders, or sidewalks for new sod to seat properly. If spot sodding is needed, it is very important that the new sod is the same level as the existing sod. We offer a full warranty on any sod we install for four weeks(See Warranty for details).